Location: Spinal column at the level of the sternum bone, in the region of the cardiac plexus. Vibrations: Anahat vibrations are felt in the little (pinky) finger. Associated Element: Anahat is aligned with the essential element of air. Associated Color: Red or air/’ash colored.’ Air, having oxygen in it, is representative of the most critical element of all for sustaining life. Physiology/physical regions governed: Anahat’s primary physiological function is to regulate heart (circulatory) and lung (respiratory/pulmonary) function. Anahat also controls the breasts and thymus gland, a small gland located behind the top of the breastbone involved in producing the immune system’s T-cells. The fundamental qualities of the Anahat or Heart chakra are pure, unconditional love and compassion. Nourishing this chakra helps fix broken maternal and paternal relationships. And because we tend to reap what we sow, maintaining a strong Anahat chakra helps you attract other individuals into your life who have strong hearts and can offer you pure unconditional love, kindness and compassion. It is through the Heart chakra that we become confident, secure, morally responsible and emotionally well-balanced. A balanced Anahat allows us to feel the pure joy of existence and discover meaning and purpose in our lives. Just as the human heart continually pumps blood throughout the body in order to sustain it, a strong Anahat or Heart chakra continually infuses us with love and compassion for humankind. Love, in other words, is the lifeblood of the soul, and of our relationships with other human beings. In Sahaja meditation, the Self of Spirit is reflected in the Heart chakra. The Spirit may only manifest when our hearts are cleansed, open and receptive. A strong Heart chakra helps us understand the true meaning of love. We develop pure relationships and love everyone unconditionally, without expectation — like a mother loves her children. Yet, we don’t become overly attached to or dependent on those we love. Our sense of Self is healthy and whole. Our past conditionings can lead us to confuse love and compassion with possession or selfishness. After Self-Realization, energy flows to the Heart chakra, purifying our attention. The heart is cleansed through pure attention and pure desire. We become more sensitive, compassionate, and benevolent toward others without regard to self-interest. We are able to love for love’s sake, for pure love gives without interest. It is not judgmental or prejudiced by differences that we may perceive in others. 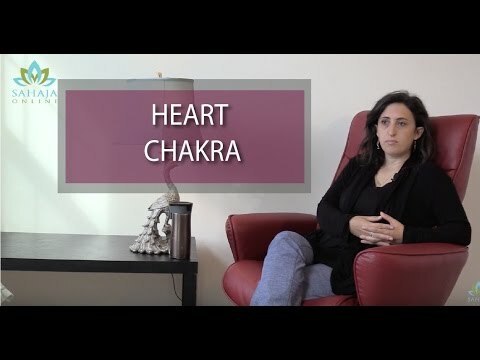 As the Heart chakra is strengthened and nourished, our preconceived mental or external symbols or representations of love give way to deeper feelings of true, unselfish love and compassion. Unconditional means loving others despite the fact that they are different from us, or have committed acts that we may not approve of. We develop more holistic perspectives of the world, so concepts such as “different classes of people” may either cease to exist in our minds, or are easily transcended. We are able to transcend such black-and-white dichotomies. We develop a higher tolerance for doubt, uncertainty, and ambiguity — such states no longer make us feel anxious or insecure. A strong Anahat ultimately helps us become transcenders. In forging soulful connections to the universe, we add deeper meaning and purpose to our own lives. Transcenders are far more consciously and deliberately motivated to pursue pure values such as truth, beauty, goodness, and unity. It is through Anahat that we develop a greater capacity for tolerance and acceptance of others, even when we disagree with their actions. If we must confront someone, we speak from a foundation of love and compassion, rather than from ego or the need to impose upon them our will or expertise. We’re respectful of the need to respect social rules. Anahat chakra helps us develop a moral code of conduct for ourselves and appreciate “proper protocols.” We intuitively understand how to set boundaries for our own behavior and respect the boundaries of others. Our relationships automatically improve. We do not base our choices solely on convenience or expediency, or make decisions out of self-indulgence, egoism, or a desire to be the anarchic or “contrarian type.” Nor are we rule-bound, overly formal, stuffy, or overly moralistic (self-righteous and preachy). Our moral codes are rooted in balance, dutifulness and conscientiousness — qualities that always take into account the well-being of others, as well as our own. Anahat brings out the Good Samaritan in us. A strong Anahat increases our innate capacity to express unconditional empathy and benevolence toward others — even strangers — without regard to self-interest. You may begin to process the world differently, devoting more effort to higher, self-actualizing pursuits, such as relieving global suffering and seeking solutions to major world problems — “causes outside your own skin.” You may find yourself increasingly endeavoring to play a role, however small it might be, to make the world a better place. You may experience increased social consciousness and feel a greater sense of moral responsibility to humankind, in general. As a result, you begin to experience that deeper sense of joy and satisfaction that comes from helping change other people’s lives for the better. The Heart chakra allows us to feel the pure joy of existence and discover our meaning and purpose in the world. Pure joy is a sustained inner surge of positivity and optimism, rather than a mood or momentary state that pivots on passing events. We become better balanced emotionally. Our confidence and self-image improves and self-esteem becomes more secure. In fact, you may find that fears, anxiety and insecurities — and the problems that stemmed from these emotions — simply vanish. Insecurity, anxiety and fears can weaken the Anahat chakra. In fact, insecurity and anxiety drive many of the problems we experience in our lives. Through the confidence, self-reliance and secure self-esteem instilled by Anahat, we develop stronger coping mechanisms, and ultimately emotional resilience, which protects us against future adversity. A strong Anahat helps build a strong immune system. The heavy burdens of stress and fear weaken our immune systems over time, which makes us more vulnerable to illness. But a strong Anahat promotes the creation and nourishment of antibodies, which ward off antigens (toxins and foreign substances such as bacteria and viruses).